Situated overlooking the River Dranse, the property is a one minute walk from the main ski bus stops and also the fantastic bars and restaurants by the church. It is also very close to the main supermarket. The large open plan living room makes this an extremely spacious property and all of the bedrooms are also a good size. There is a large outside area and ample parking for up to three cars. One of the bedrooms is en suite but there are also two other bathrooms to service the other two bedrooms. The bedrooms consist of a twin, a double (that can also be a twin) and a large quad room with two single beds and bunk bed. There is a large boot room for your skis/boards/boots or bikes which is heated in the winter. This property would be perfect for either families or groups of friends. *** We can arrange 10% off your lift passes if booked through us. ***All towels, linen and standard clean included in the price. Welcome to Morzine! Morzine is an amazing ski village nestled away in the French Alps. We provide quality SELF-CATERED CHALETS AND APARTMENTS in the THE SKI AREA of the Portes du Soleil with a service that is second to none. We help you with everything you need for that perfect powder infused holiday. Whether in the enquiry stages pre-booking, or even in resort at your chosen accommodation, we are always available to ensure a fantastic stay. You can find out everything about our SELF-CATERED CHALETS AND APARTMENTS in Morzine France and how we can help with TRANSFERS, LIFT PASSES, SKI HIRE and CATERING, all by clicking on the links here or above. We are here in Morzine to provide good value, high quality, self-catering ski holiday accommodation for all our guests. We have organised discounts on your behalf for LIFT PASSES and for excellent quality SKI HIRE should you choose to stay with us in any of our SELF-CATERED CHALETS AND APARTMENTS in Morzine. We can also take the hassle out of your outward journey by having your LIFT PASSES ready in your ski chalet when you arrive. There are many other SPORTS & ACTIVITIES in the area to enjoy, so if you need any advice for your self-catered ski holiday please don't hesitate to CONTACT US. If you enjoy the flexibility of quality SELF-CATERED CHALETS AND APARTMENTS in a wonderful ski resort in France, then a ski holiday with us in Morzine is waiting for you. Spacious apartment, great location in village. Spacious apartment, great location in village. Clean and well equipped, would come back. Really impressed with the level of service we received from enquiry stage until the end, Ben and Beth at Alptitude Chalets were so helpful with everything we needed. La Dranse One is a fab location near the supermarket and the village centre. It's a lovely spacious apartment and was really clean when we arrived.. WE'll be back! 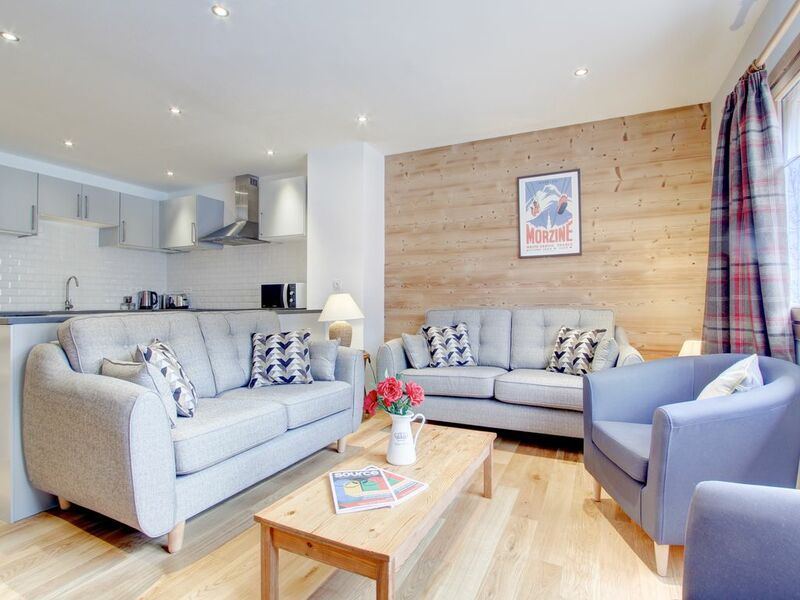 La Dranse is a refurbished three bedroom open plan apartment in the very heart of the old town in Morzine. Situated overlooking the stunning River Dranse, the property is a one minute walk from the main ski bus stops and also the fantastic bars and restaurants by the church. It is also very close to the main supermarket. Ski: Morzine is situated in the heart of the Portes du Soleil ski area. It is a stunning chocolate box town that leads onto Avoriaz and Les Gets ski areas easily. The area is superb whether you are a beginner or an off-piste expert. There has been a great deal of investment by the local ski companies in the lifts and the pistes are kept in a great condition throughout the season.